The restoration of Towanda’s Keystone Theatre is a project meant to benefit all of this county’s residents, stressed the Bradford County Regional Arts Council’s (BCRAC) director, Brooks Eldredge-Martin. "We’re trying to make it a county-wide project," he said. "It’s our hope that the entire county will identify with it. "Support for the restoration project has been very broad," he continued. "Bradford County citizens are excited and hopeful for the project. Their willingness to help on a volunteer basis is a very healthy sign. "So many groups—the Valley Chorus, Wyalusing Musical Society (and other organizations)…are working to bring Towanda around…This project ties in with the Main Street program and the Waterfront program.."
According to Eldredge-Martin, the Bradford County Needs Assessment Forum listed the "lack of recreational facilities" as one of the concerns for this area." "Area industry has reported difficulty in hiring and retaining professional people due to the remoteness of cultural activities," he pointed out. Films, musicals, theatrical, artistic and educational programs will all be encouraged, he said, especially those of local groups and individuals. Interest shown so far has ranged from live theatre presentations and chamber music, to magicians, movies and country music. Eldredge-Martin is optimistic that the community will pour out to see Arsenic and Old Lace when the Winding River Players present it at the theatre on October 21, 22 and 23. But, besides the entertainment a performing arts center will provide the county, the hope of those involved with the project is that it will awaken the cultural consciousness of the community. The cultural rebirth should create jobs, bring tourists and enhance the civic pride and general welfare of those who live in the area. "The timing is perfect," Eldredge-Martin said, "for our theatre project to become a ‘keystone’ in the redevelopment of downtown Towanda." The Arts Council’s president Pat Zalinsky agrees. "I think it will do fantastic things for the area," she said. "It will bring people from outside the area into our area, and also bring some of the local people back into the downtown." Ruth Tonchel, on the board of directors of the Arts Council, has similar sentiments. She explained how she became interested in the project. "I was always interested in historic preservation. This (project) is exciting to me as a Towanda resident. I think it will create more pride in the town’s people. They will feel more connected to downtown Towanda because of it. Maybe they’ll even shop here because of it, rather than going someplace else." According to Ms. Tonachel a "tremendous amount" of support for the project has already begun. "Once everyone sees good things happening a wave of enthusiasm will be created." The finished product, she explained will be both beautiful and irresistible. "There’s no doubt that people will come then," she said. Hale’s Opera House was opened to the public on Sept. 1, 1887 by the firm of Hale and Codding. For years it was a major social and cultural center for Bradford County. Residents attended programs ranging from John Philip Sousa’s Band to high school commencements. The famous boxer, John L. Sullivan, once brought a show to town that drew over 1400 people to the 900-seat theater. 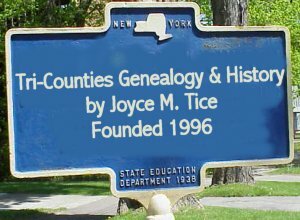 People involved in the early theatre have many descendants living in this region. Neighboring Canton was home to nationally famous stage stars Harry and Fannie Davenport and Frank and Eleanor May who all played Towanda. An early deed shows that the grandfather of current Bradford County President Judge Jeffrey Smith, E.L. Smith, once owned the building. Early playbills list local actors with familiar names such as Betts, Bresee, Turner, Meredith, Welles, Hoffman, Parsons, Jennings, Overton, Bull, Gillette, Sill, Dayton, Hagerman and Vought, among many others. Advertising in the playbills were Porter’s Drug Store, the First National Bank, Towanda Printing Company and the Patterson Screen Company. Billy Woodin, the opera house’s first manager, changed the name of Hale’s Opera House to the Keystone Theatre in 1913. What a day it was for Towanda when Sousa came to town! Lola Long, 88, closed her eyes and tilted her white head back to bring back that long ago summer day when she was 14; that day when John Philip Sousa brought his band to perform at the Keystone Theatre. According to Mrs. Long, once in North Towanda, Sousa and his band boarded the S & NY and were taken directly to the back door of the theatre in Towanda. 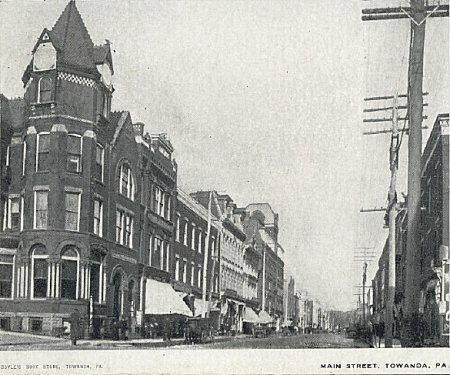 Mrs. Long said that she and her parents and brother came to Towanda from Powell that day in a horse-drawn surrey. They were all decked out in their Sunday-best. Sousa was in town that day for just one afternoon performance, she said, But what a performance it was. Though that day when Sousa first came to town was especially memorable, Mrs. Long said that any afternoon or evening spent at the Keystone was a special treat in those days. Musicals were a favorite of hers. As a schoolgirl, she remembers being dazzled by the fancy, short dresses of the dancers. But the play that she remembers best was a performance of Uncle Tom’s Cabin that came to the Keystone when she was 15. She remembers it because it made her cry. According to Mrs. Long, P.C. Martin, then superintendent of the tannery in Powell (Tannerytown) drove her and her brother, Aaron, and their children, Mahlon and Norma Martin to the Keystone in Martin’s long, black, seven-passenger Hudson. The teenagers were dropped off at the theatre to see the play, while the elder Martins visited friends in Towanda. “The four of us were sitting together,” Mrs. Long recalls, laughing. “I believe it was when little Eva died – Norma and I had a crying spell. Oh, how those boys made fun of us! Two years later, in 1947, Mrs. Long (then Lola Bailey) and her family were among the theatre-goers who crowded in to see The Birth of a Nation, a silent film held in high regard even today. She recalls the “real dark brick walls” of the theatre and the “dark curtains” that cloaked the stage. It was not until Mrs. Long’s college days that “talkies” came to the Keystone, she recalls. Apparently they were quite a hit with the local folks. Mrs. Long said she traveled to Waverly to see Gone with the Wind when it came to the theatre there some years later. Then she went to see it again a short time later when it was shown at the Keystone. Sometimes, she said, they’d drop their children off at the movies and shop or visit friends. “All the stores in Towanda were open Saturday night,” she recalls. When her children were older, they sometimes took the S & NY from Powell to Towanda to take in a Saturday matinee at the Keystone. Through the years – Mrs. Long resided in Powell for 86 years before moving recently to the Senior Citizens Building in Towanda – The Keystone Theatre provided many hours of entertainment as well as lasting memories for her entire family. She said she’s “all for” the current restoration project going on at the theatre. 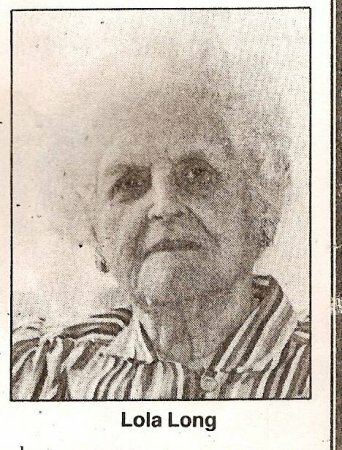 Lola Long attended Mansfield Normal School (Lola BAILEY Long was mother of site guest Phyllis LONG Rockwell) Born 1900 she lived to 100. This dates the article at 1988.